Some people say this feature only serves to massage my oversized ego but I say it allows me to talk about Arsenal’s most current issues in one post. We’re hoping this can be a regular feature so please feel free to debate below and I’ll likely join in below the line too. Thanks! Henry has been brought in to essentially replace two players – Marouane Chamakh and Gervinho – which indicate that an additional attacking signing may still be a possibility. It’s unlikely, though, that he’ll walk into the team because Arsène Wenger has complete trust in the recently maligned Andrei Arshavin having played him in the most games for Arsenal last season. Rather, Henry will be involved mainly in rotation but most importantly perhaps, he’ll be the inspirational figure that Arsenal have so desperately needed in the past. With Henry, what’s important is not where he’ll play – Wenger envisaged Henry doing more creating had he stayed on at Arsenal rather than relying on pace. (Incidentally threading passes to Jose Antonio Reyes with whom he had a great rapport with on the pitch). He has the chance to do that now in either a “false9”role or as that famous left to centre role instead of in a 442. Henry’s legacy won’t be tainted just because he has come back after his peak for a two month spell. Robbie Fowler returned toLiverpoolin 2006 and although he was not the same player as he once was, the little bit of quality that evokes old memories are the ones that shine through greatest. Besides, it’s not often you get to see your heroes return and that should bring great joy to Arsenal and football fans. A: That myth seems to have originated from his “pre-Invincibles” years and in particular, his unwillingness to make substitutions for tactical reasons. It’s true, his changes are primarily scientific, taking off players like Dennis Bergkamp on 70 minutes because he knew his intensity wouldn’t last beyond that and usually making like-for-like substitutions. But theirin lies the misunderstanding of Wenger because it’s not that he’s tactical inept or incapable of making radical decisions, it’s that his management style is about trusting the expressionism of his players and the ability to find solutions themselves. That was particularly the case when in charge in his early years and especially of the legendary unit in 03/04 (although the argument is also valid that he could have done more in Europe, tactically). Nowadays, you’ll see more tactical decisions from Wenger and that usually happens when you have a team who’s still learning and still not so confident in their abilities to find solutions as the team is now/has been after the break up of the Invincibles. (Indeed, you have to look back at the Champions League run of 2005/06 to see the beginning of a more hands on approach from Wenger). What a refreshing thought! Although it’s probably true that Arsenal should be judged more on their attacking play. In terms of whether Arsenal “struggle more with scoring than conceding”, I think it boils down to the type of chances they have and consequently allow opponents to have. Because Arsenal attack with such fervour, they leave more spaces at the back and thus the chances that they concede tend to be of higher quality i.e. more space, time, attacking with speed. (Although their big weakness still remains aerially). In comparison, Arsenal’s chances often have to be manufactured or squeezed therefore their chances tend to be closed down more quickly, need to be processed quicker etc. However, in saying that, Arsenal could be more clinical. Robin van Persie has had 94 shots this season (the next top-scorer, Demba Ba has 62) but that figure is arbitrary because van Persie is still as clinical as most strikers, converting 18% of his shots (which is a respectable figure). But you’ll have to look at the type of chances he has, often creating chances himself. Of course, looking at the QPR game, he could have scored more than the one goal but then you’ll see that he created at least two chances with his dynamic dribbling and one more that was headed wide. All in spite of a lack of space. It’s not unexpected then, that the goal he scored, was the easiest; a gift from the QPR defence. Often people ask how Arsenal can improve: the three striker system is placed so Arsenal can be more dynamic and goalscoring coming from more than one source although that is not the case yet. Nevertheless, it must be looked at the role Theo Walcott and Gervinho have in Robin van Persie’s goals. Not having full-backs as much affected Arsenal’s play as they help stretch the play while the return of Jack Wilshere is welcome as his drive and the ability to play through passes is missing. Aaron Ramsey may have improved on the later but he’s hesitant to change the emphasis of Arsenal’s attacks by running with the ball as Wilshere is due to misgivings of his pace. (Ditto Mikel Arteta thus Alex Song’s runs have been key). As Wenger once said, “the measure of football is the ratio of chances created to to chances conceded” therefore he’ll be the harshest judge of Arsenal’s attacking play. It’s true Arsenal have often struggled with high pressure, most spectacularly in the Champions League, although how they got through with one game to spare is a wonderment! What Wenger tends to do is push his central midfielders up the pitch to give his centre-backs more time on the ball. Which is a valid tactic although it doesn’t really answer the question because if they are still pressed, the centre-backs won’t have many options. Arsenal don’t play long-balls so spreading the play laterally is not really the solution. Rather, they could learn from Barcelona and spread the play sideways although that comes with more risk. The issue, as Backwards Gooner highlighted recently is whether you see it as a problem at the back or at the front. Wenger, against Fulham, saw it at the front so he took of his two under-performing wide players – the two players who should have gave Arsenal a speed outlet but didn’t – in favour of those who keep the ball better – Yossi Benayoun and Tomas Rosicky. It didn’t really work either way because The Gunners were unable to stem Fulham’s attacks and thus they were punished. In that situation, I would have taken a radical option and put on Marouane Chamakh so Arsenal get an out-ball. In one sense though, this Arsenal side has a tendency to be pushed back and thus, Wenger will have to find solutions to correct that problem. Arsenal have looked better when there’s rotation between the midfield to drag opponents out and that remains their most obvious and easiest to implement solution. 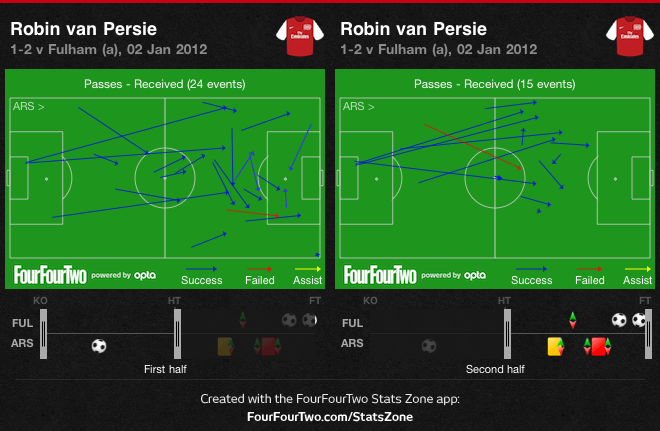 <Figure 1: Van Persie passes received v Fulham>Arsenal were unable to respond to Fulham’s second-half pressure and as shown by the passes to van Persie, were unable to get the ball out of the back effectively.